The subject of Gnostic anthropology explores the history of our planet Earth, and describes in detail the civilizations that have inhabited the Earth in the past and that will inhabit it in the future. Gnostic anthropology is radically different than what present-day historical, anthropological, and archaeological texts teach us, and is best studied with an open mind and with the help of inner meditation. A study of Gnostic anthropology will enable us to see more clearly where our present civilization stands, as well as where we personally stand, with respect to the overall history of the planet. “History repeats itself” is a profound statement, not only because social and political incidents seem to recur, but because larger cosmic cycles and events also repeat themselves. These major cycles determine the final destiny of humanity, and by understanding them we are able to grasp where our civilization is headed. Gnostic anthropology is primarily concerned with the major races of humanity that inhabit the Earth at different times. Every planet must support seven major races of humanity, called “root races”, during the planet’s existence. After these seven races have emerged, subsisted, and dissipated from its surface, the planet becomes a lifeless moon. During the previous cosmic day our moon was a planet full of life. Following the course of every planet, however, it supported its seven root races and eventually became what it is today – a barren, lifeless moon that now orbits the Earth. Present-day humanity is part of the fifth root race of the Earth, called the Arian race. The first root race was the Protoplasmatic race. These beings were fully awake, divine individuals, with bodies that were semi-physical, semi-etheric. They were androgynous beings, having neither male nor female sexual organs. They lived on the continent of Thule, which was located where the North Pole is now found. The second root race was the Hyperborean race. These beings lived on the continent of Hyperborea, in what in now Northern Europe. They were also awake, divine, and androgynous beings, and reproduced by fragmentation. The third root race was the Lemurian civilization. The Lemurians inhabited the great continent of Mu, which was found where the Pacific Ocean is now located. The first half of the Lemurian race consisted of beings that were hermaphrodite, whose bodies had both sets of sexual organs. The splitting of the sexes into male and female occurred during the second half of the Lemurian civilization. The fourth root race was the Atlantean race. These beings inhabited the continent of Atlantis, located where the Atlantic Ocean now stands. After the submersion of Atlantis, the fifth root race to inhabit the Earth is our current Arian race. The sixth and seventh root races are yet to come, following the end of our Arian civilization. Each root race exists on Earth for as long as it takes the solar system to go around the entire zodiacal belt. This length of time is called a “sidereal year”, and is documented in modern astronomy. Each sidereal year lasts 25,68 years, and, for the purposes of Gnostic anthropology, begins and ends when the Earth is found in the zodiacal constellation of Aquarius. The Earth stays within each constellation for 2164 years before moving on to the next. Following Aquarius it moves to Capricorn, then to Sagittarius, and so on. At the end of the sidereal year the Earth completes the cycle by moving from Pisces back to Aquarius. On February 4, 1962 the Earth passed from the constellation of Pisces to that of Aquarius, and we thus entered the Aquarian Age. During its life-span over the course of one sidereal year, a root race undergoes four seasons, or ages: a Golden, Silver, Copper, and Iron Age. During the Golden Age, no member of the race possesses the psychological ego. It is a true “Golden Age”, and during this period the esoteric mysteries are alive and flourish. The psychological ego begins to take form in the Silver Age. It is still a noble period, but the mysteries have begun to lose a bit of their light. The light of the mysteries continues to diminish in the copper age, as the ego expands, while this light is almost completely gone in the Iron Age, when the ego is fully alive and present. This relationship of the ego with the four ages began with the Lemurian civilization, and recurred again during the Atlantean and Arian races. A root race begins at the start of a sidereal year. The Golden Age begins while the Earth is in Aquarius, and, as the Earth moves through the zodiacal belt, the ages also progress: from the Golden, to the Silver, to the Copper, and finally to the Iron Age. By the time the Earth enters Pisces and then returns to Aquarius, the Iron Age of a civilization has begun. During the Iron Age a civilization has degenerated from the time of its Golden Age. The degree of degeneration, however, is particular to each race. The Protoplasmatic and Hyperborean races had not declined during their Iron Age because they were awake and divine beings, not possessing the psychological ego. The Lemurians reached a certain level of degeneration, while the Atlanteans declined even further. Our current Arian race, however, has reached a degree of degeneration that has not been matched during the entire history of the Earth. The amount of ego that we carry in our psyches is vastly greater than the ego possessed by previous races. Wars, hatred, envy, violence, environmental destruction, ill-will, etc. are commonplace in today’s society. Since the Iron Age of a civilization occurs near the end of the sidereal year, every race comes to an end during its Iron Age. It can be considered as the Earth “purging” itself from the corrupt humanity that is inhabiting it. Although every root race exists on the Earth for only one sidereal year, the period of time between the end of one race and the beginning of the next can be many thousands or millions of years. In other words each root race lasts for only one sidereal year, but many sidereal years may pass before the next root race begins. But why does each race end? What brings about its demise, thus preparing the way for the next race? To properly answer these questions it is necessary to understand certain cosmic cycles that have occurred and that will continue to occur throughout the entire life-span of the planet Earth. A very important cosmic event takes place each time the Earth enters the zodiacal constellation of Aquarius. This event causes great natural disasters to occur, and has been responsible for the end of every root race that existed upon the Earth. At the end of every sidereal year, after moving from Pisces to Aquarius, the orbit of the Earth approaches the orbit of a planet found in the Tyler Solar System. In Gnosis this planet is known as “Hercolubus”. In the Bible this planet is referred to as “Wormwood”, while modern astronomers have named it “Barnard I”. Hercolubus is about 600 times the size of the Earth, and so as the orbits of the two planets get closer their gravitational and magnetic fields exert forces on one another. Hercolubus never comes close enough to physically collide with the Earth, but due to its size exerts very strong gravitational and electromagnetic forces. These forces cause great natural catastrophes to occur on the Earth, such as volcanic eruptions, earthquakes, tidal waves, hurricanes, etc. In addition, Hercolubus’ gravitational fields cause the Earth’s axis of rotation to tilt. Currently it is tilted about 23 degrees from its original position, and as Hercolubus comes closer and closer the tilting will accelerate. This will result in the poles becoming the equator and vice versa. Currently we are in the 37th year of the Age of Aquarius. Hercolubus and the Earth reach their closest distance during the beginning of the Aquarian Age; the natural catastrophes that have resulted have been responsible for the end of the previous four root races, and will be responsible for the end of our present civilization. We are already seeing more natural disasters throughout the world than in the past. As Hercolubus approaches these disasters will accelerate exponentially. The encounter of the Earth with Hercolubus takes place every sidereal year, and is thus a natural cosmic event. The first few races were not afraid of the disasters since they had not degenerated. They still had extraordinary powers, and used them to escape the catastrophes. The Protoplasmatic and Hyperborean races, for example, simply submerged themselves into the 4th dimension when the catastrophes began multiplying. The portion of the Lemurian civilization that had not degenerated did the same, while the rest perished. The vast majority of the Atlanteans died during the submersion of Atlantis, but a small minority was able to escape. Unfortunately, due to the extreme degeneration of the Arian race, there will be few who will survive the upcoming cataclysms. Master Samael Aun Weor openly declares in his writings that we are at the times of the end. He states that when the disasters begin occurring , those who have eliminated 50% of their psychological ego will be taken to a place where they will be safe from the catastrophes. They will watch, in safety, the cataclysms that will take placed on the rest of the planet, while continuing to work on themselves in order to eliminate the rest of their ego. This group of people will provide the seed for the sixth root race, and no one with ego will be allowed to inhabit the Earth during the Golden Age of that race. This is why the Gnostic teachings, which were taught in secrecy only in authentic mystery schools, are now being made freely available to the public – in order for whoever genuinely works on himself or herself to be able to escape the upcoming disasters. In order to eliminate the psychological ego and to awaken consciousness we must practice the Three Factors for the Revolution of Consciousness. The Three Factors are the foundation and the essence of the Gnostic Esoteric Work. By practicing the Three Factors we will be able to study Gnostic anthropology in an experiential manner, and to verify its validity through direct, personal, and conscious experience. In this way we will not naively believe or disbelieve, but rather we will know the truth for ourselves. Obviously we find ourselves in the times of the end.. When we look at the earth with its four seasons, we understand quite well. Our planet rotates around the Sun in 365 days, some minutes and fractions of seconds; this is called a terrestrial year that has four seasons: spring, summer, fall and winter. We cannot deny that there also exists the sidereal year, the cosmic year. 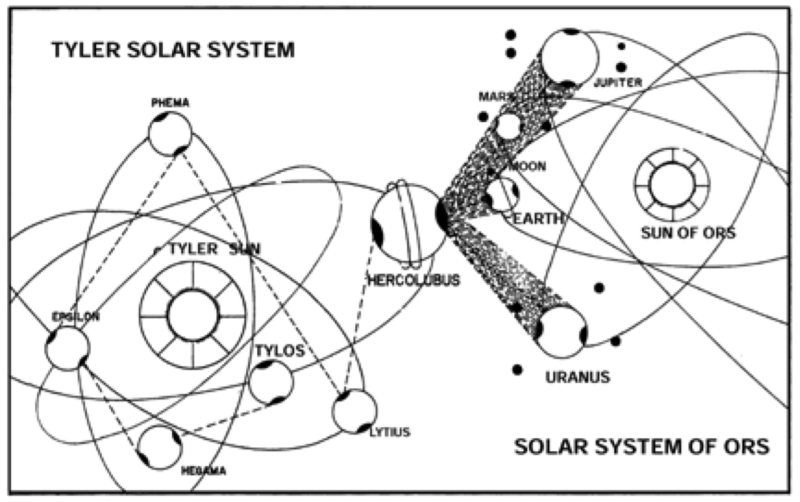 Our solar system of “ORS” in which we move and have our Being, journeys around the zodiacal belt in 25, 920 years and this journey of the solar system around the zodiacal belt is what constitutes a sidereal year. The sidereal year, just as the terrestrial year, has four seasons: spring, summer, fall and winter. The spring of the sidereal year is the golden age in which life is a true Eden; humanity comes out perfect from the hands of the Creator, the solar hierarchies govern and happiness throbs and palpitates everywhere. In summer, or the silver age of the sidereal year, the first splendor pales a little, the solar hierarchies continue governing a world without borders, a world where there is only peace and love. In the fall, or copper age of the sidereal year, humanity begins with its borders and its wars with its hatreds and its crimes. However, in winter or the iron age, everything ends with a frightful cataclysm. We find ourselves precisely in winter, in the age of Kali Yuga, in the iron age. Every time that a race arrives at the iron age, at Kali Yuga, it perishes because of a great cataclysm. What would we say about the Lemurians? They perished because of rain, fire and earthquakes! And what of the Atlanteans? What has been said? What do the sacred books say? Truly everyone affirms that there was a universal flood. It was then that the axes of the earth turned moved and millions of inhabitants perished in the waters of the Atlantic ocean. The beginning of the end of this Arian race began in the constellation of Aquarius. It was then that the sun began its journey, along with all the planets of the solar system, around the zodiacal belt. A race lasts as long as one journey of the solar system around the zodiacal constellations. And now, it has returned to its starting point. The sidereal year is concluding and before long it will have arrived at its end. During the journey of the solar system around the zodiacal belt, the poles of the earth begin deviating. The axes of the earth will be changed. We already know that the magnetic pole does not coincide with the geographical pole. The North Pole is melting…In this manner then, the revolution of the earth’s axes is a fact and can be demonstrated with perfect mechanical apparatus. Add to this something unexpected. I want to refer to Hercolubus, the gigantic monster that is to swallow our planet earth. …it is a gigantic, powerful world, six times bigger than Jupiter, and it belongs to the Tyler solar system. It is not, as many suppose, a displaced planet from some solar system. It has not been displaced, it rotates around the gravitational center of the Tyler solar system. Before long, that gigantic world will pass through at an angle to our solar system and it will precipitate a catastrophe. In celestial mechanics, Hercolubus helps to make the poles vertical; it is a cog in the great machiner. The approach of Hercolobus is at our door. …when Hercolubus passes close to the earth, obviously it will precipitate a catastrophe. The gigantic world possesses an extraordinary force of attraction and consequently, the fire of the volcanoes will leap out here, there and everywhere. Water will sing a duet with fire, the revolution of the earth’s axes will change the seabeds and all human beings will perish. I repeat that astronomers already have Hercolubus in their sight. It is a powerful giant that will pass through at an angle to our solar system. When this happens, the revolution of the earth’s axes will violently accelerate, and then the catastrophe will come. Some scientists propose to push Hercolubus further away with atomic explosions and this will be useless. It is impossible with pure atomic bombs to push further away a monstrous, gigantic, powerful planet. Before Atlantis existed, it also did away with another continent. We know very well that the continent of Mu or Lemuria, through ten thousand years of earthquakes and incessant volcanic eruptions, came to sink in the waters of the Pacific ocean. When Hercolubus passed through at the end of Kali Yuga,, at an angle to our solar system, on the continent of Atlantis there came the universal flood, the seas were displaced, changing beds, and Atlantis was finished. The remains of Atlantis are the Canary Islands, etc., just as the remains of the Lemurian continent is Easter Island, facing the coast of Chile, the archipelago of Oceania, Australia, etc. Similarly, then, when Hercolubus once again passes through at this angle to our solar system, you can be absolutely certain that another catastrophe will come. This indicates to us that the catastrophe that is coming is not the first, neither shall it be the last. The apocalyptic times have arrived. Humanity has broken open six seals of the Great Book of St. John; when it breaks open the seventh seal, the catastrophe will be produced. One can object that many others, in the past, awaited the end and nothing happened. I would like to tell you that this time we speak of celestial mechanics. If celestial mechanics did not exist, the entire cosmos would end in a catastrophe. Just as on the Atlantean continent there was a chosen race that served as a base or nucleus for the formation of the fifth Arian race and which today perversely inhabit the five continents, I will also state that today there will be formed a nucleus for the sixth root race. …let us then prepare ourselves. Earth is being subjected in these moments, to a great agony and the end of this agony is called death. When a sick person is agonizing, when one presents with unmistakable symptoms of death, we well know that what follows is defunction, passing away.